Take one look at Turtle Beach’s Atlas Three and Stealth 300 headsets and you’d probably swear blind they were exactly the same thing. Apart from the Stealth 300’s giveaway blue highlights, both headsets share the same design, the same 3.5mm audio connection and flip-to-mute microphone, and both have the rather baffling need to be charged every 40-odd hours due to their built-in bass amplifier gubbins despite the fact they’re both fundamentally wired headsets instead of wireless ones. Thankfully, the Atlas Three is much more than just a monotone palette-swap of Turtle Beach’s mid-range console-oriented headset. For starters, this one’s actually been specifically designed with PC peeps in mind. The Stealth 300 was fine for laptops and wireless controllers that came with combined headphone and microphone jacks, but trying to get it to work with an actual PC required a separate splitter – something that’s bundled in with the Atlas Three straight off the bat. Of course, a bundled splitter does not a best gaming headset make. 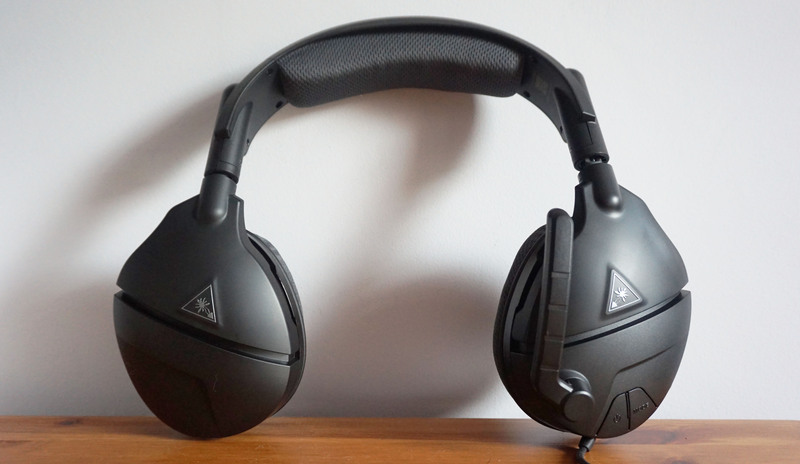 Good thing, then, that the Atlas Three also rectifies another big problem I had with the Stealth 300, in that it’s actually a pretty damn good headset for general music listening as well as playing games. The Stealth 300 made a good impression when I booted up my gaming test suite back in July, but switching over to my collection of soundtracks in iTunes descended into one big boomy mess. Happily, the Atlas Three produces a far more balanced sound than its console cousin, provided you choose the right bass mode, that is. On its default setting, the strings and piano sections in my Final Fantasy XV soundtrack sounded a bit thin and limp, but switching over to the second bass mode (indicated by two little beeps as opposed to one on the first mode) was a massive improvement. The soundstage opened up dramatically, giving equal weight to both highs and lows as well as plenty of detail in the surrounding percussion. Everything from game soundtracks to rock and pop songs sounded excellent on this preset, and the bass felt warm and rich at all times without feeling like it was drowning everything else out as a result. Personally, I didn’t think much of the third and final bass mode (three beeps), which seemed to shunt strings and other highs even further towards the back of the room than the first mode did, but at least there’s a decent variety of presets to choose from if you happen to prefer a boomier quality to your regular music tracks. The Atlas Three continued to impress when I started playing games with it, too. In Doom, the game’s pulsing soundtrack sounded wonderfully detailed and energetic, the deep boom of my Super Shotgun ringing satisfyingly in my ear as I listened to the tinkling blood splatters that followed, and I was able to accurately identify the location of any straggling demons. I was impressed with how it handled Hellblade: Senua’s Sacrifice, too – which is more than can be said for the HP Omen Mindframe I reviewed earlier in the week. Here, the voices inside Senua’s head sounded like they were coming from all angles, their clear whispers and snipes providing oodles of atmosphere and a strong sense of menace. I’d recommend using either the second or third bass presets for games like this, as the first one all but destroyed much of the finer details in Hellblade’s soundtrack such as flickering fires and the gentle paddling of Senua’s row-boat. There was less of a difference in Doom, probably due to the sheer amount of stuff going on in that music, but quieter, more atmospheric games like Hellblade need as much detail as possible. As for Final Fantasy XV proper, that too was best served by the second preset. Its rich orchestral music sounded perfectly fine on the other modes, too (and you’d likely be happy with any of them if you didn’t know which one you had enabled), but the second definitely had the best zips and zaps as Noctis teleported himself across the battlefield, and the most balanced soundscape overall. For all its clear audio chops, however, the layout of the Atlas Three’s controls still drives me up the wall. These are all in exactly the same place as the Stealth 300, so that means a volume wheel right next to the mic volume wheel on the back of the left ear cup, and the power button right next to the bass EQ mode button on the side. Each pair is impossible to tell apart once you’ve actually got the thing on your head, and there were multiple times when I ended up reaching for the wrong one. Muscle memory will probably sort out these niggles in time, but I wish Turtle Beach had rejigged the design for the Atlas Three instead of using the same shell as the Stealth 300. The microphone was also mildly problematic. While my voice recordings in Audacity were perfectly clear, there was a persistent and rather loud hiss going on in the background. Admittedly, that’s probably because I had to turn Audacity’s recording volume right up to its maximum level, as setting it any lower didn’t pick up anything whatsoever. Then again, the hiss returned when I tried using it for Skype, too, so I think it’s just something you’ll have to put up with if you’re going to use it for playing online with your mates. Still, at least it’s reasonably comfortable to wear for long periods of time. Normally these kind of headbands tend to start giving me a headache somewhere around the 30-60 mark, but I was pleasantly surprised to find I could wear the Atlas Three for a couple of hours at a time. There still came the inevitable moment where I had to shift it about a bit to avoid the dreaded headset squeeze on the top of my head, but for the most part I got on with it very well indeed. As such, the Atlas Three gets a thumbs up from me, despite my quibbles with the mic and fussy controls. At this price (£65 in the UK and a rather unfortunate $90 in the US) I’d probably still go for the USB-based Corsair Void Pro RGB if given the choice (whose pricing is ironically the same as the Atlas Three but in reverse for the UK and US), if only because it’s even more comfortable and has a far better microphone. 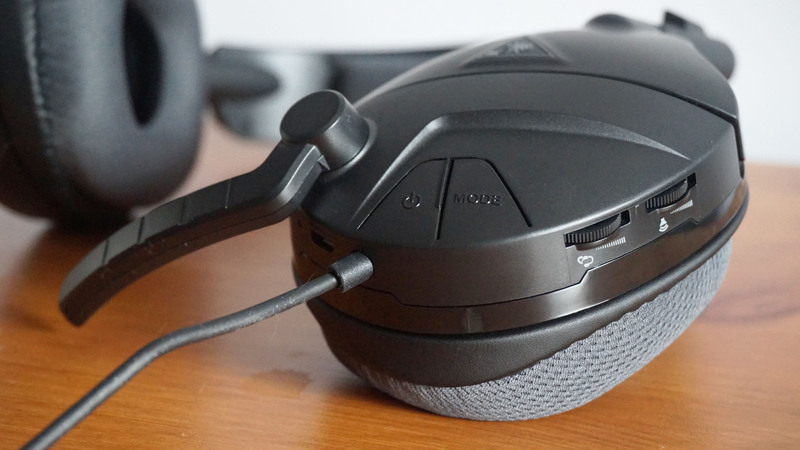 However, if you’d rather have a headset that you can also use with other devices and doesn’t cost the earth, there’s still plenty to like about the Atlas Three. 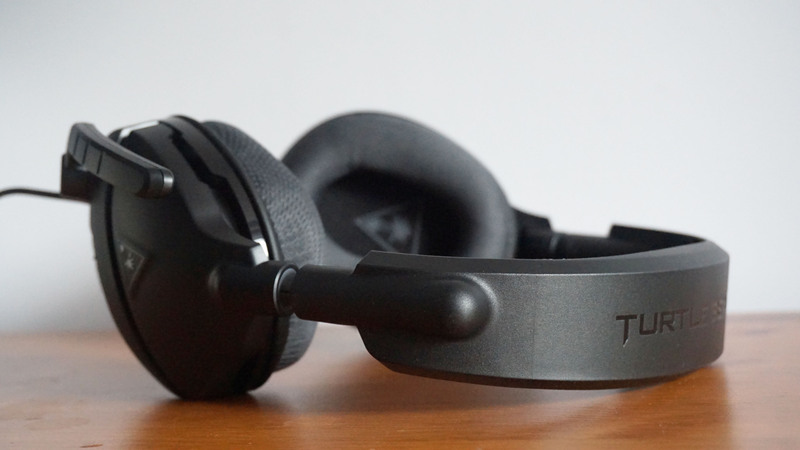 It’s definitely a better buy than Turtle Beach’s Stealth 300, and a lot more flexible to boot. It squeaks in as another one of our best gaming headset runner-ups. Tagged with feature, Hardware, Headsets, Turtle Beach.